Compost starts with a carefully blended recipe. Click below to enlarge recipe. Turning compost with an Aeromaster PT-120 turner (left) is an important part of the composting process. High quality innoculants (right) are blended with the compost. Finished compost is screened through a half inch minus trommel. • Builds that material into humus. After the compost is blended into a windrow, we turn the compost nearly every day for the first 2- 3 weeks. During this stage, the compost reaches temperatures up to 150 degrees F. The high temperatures eliminate pathogens and weed seeds. 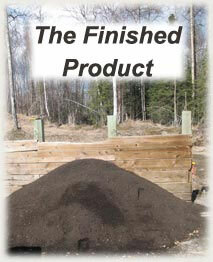 This is the break-down phase when the compost quickly changes its appearance to resemble the finished product. However, at this stage we simply have broken down organic matter. Broken down organic matter is not compost, but it is a good start. After the decomposing microbes do their work, its time for the humifiers to build up the compost into humus. This beneficial microbe community flourishes at lower temperatures. 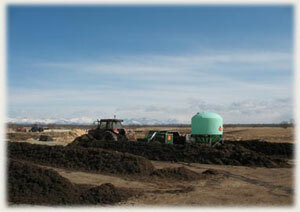 Our goal in finished compost is to have a fine compost that is the product of third and fourth generation microbes. We continue to turn the compost several times a week until it is finished around the 12th week. 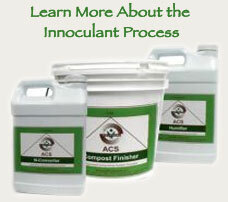 This resulting humified compost will have a powerful impact on your crops.